This Quarter Eagle was worth $2.50 when it was minted. The coin sold at auction for $2.4 million on Tuesday. One of the rarest of all U.S. gold coins, a 207-year-old Quarter Eagle, sold for a record $2.4 million Tuesday. The Quarter Eagles were worth $2.50 when they were minted and were only made in small quantities during the late 1700s and early 1800s. This particular coin was minted in 1808. The coin is so rare that most Americans in that era probably never got a chance to see it, according to Stack's Bowers Galleries, which sold the coin at auction. One side of the coin depicts Lady Liberty and an eagle is on the other side. 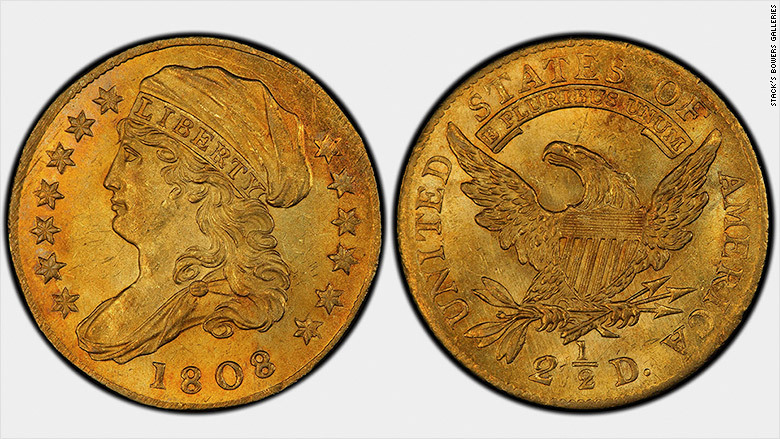 The 1808 Quarter Eagle was one in a collection of 128 coins that sold for a total $25 million at the auction. A quarter from 1796 went for nearly $1.6 million, matching a previous record. So did a half-dollar minted in 1797, becoming the most valuable half-dollar coin ever sold. 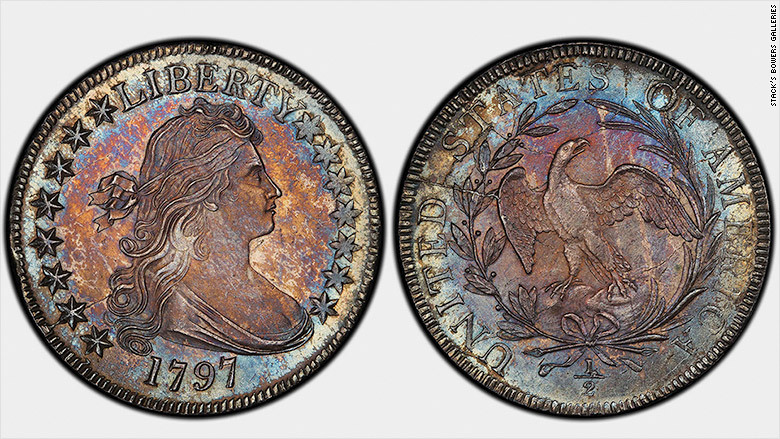 This quarter from 1796 sold for $1.6 million. A Half "Disme" (a five-cent coin also known as a half-dime) from 1792, sold for $440,625. It was made even before the first mint was built, at the request of Thomas Jefferson, according to Stack's Bowers Galleries.